Martín Gramática (born November 27, 1975) is an Argentine former American football placekicker in the National Football League (NFL). Gramática played college football for Kansas State University, and was recognized twice as an All-American. He was drafted by the Tampa Bay Buccaneers in the third round of the 1999 NFL Draft. He also played professionally for the Indianapolis Colts, Dallas Cowboys and New Orleans Saints. His younger brother Guillermo Gramática was also a kicker in the NFL. Gramática was born in Buenos Aires, Argentina. At the age of 9, he had to travel with his family to the United States, where they made their home. They settled in LaBelle, Florida, east of Fort Myers. He was only interested in playing soccer at LaBelle High School, but his kicking precision attracted the attention of the football coach of the school. He invited Gramática to try out as the team's kicker. Gramática started to play football during his senior year. As the kicker for LaBelle High School, he hit 8 out of 10 field goals, 22 points after touchdowns, and sent 38 of 49 kickoffs out of the end zone for touchbacks. His longest field goal in high school was 52 yards. Gramática played at Kansas State from 1994 to 1998. During his four college seasons he made 54 out of 70 field goals and 187 of 192 point-after-touchdown attempts, gaining a school record of 349 points in four seasons. He also set the single-season school record with 135 points and the longest field goal kicked from 65 yards. Those achievements earned him the nickname Automatica because whenever he came on the field, it was taken for granted that his kicks would be successful. In 1996 he was granted a medical redshirt. Gramatica was a first-team All-America choice by the Associated Press both his junior and senior years and received the Lou Groza Award in 1997. Notably, he was 3-3 on field goals from 50+ yards his junior year, and as a senior kicked a phenomenal 65-yarder against Northern Illinois University – the longest field goal in college and professional football history kicked without a tee. He received his Bachelor of Science degree in social science in May 1999. Also of note was his characteristic jumping in celebration after every successful field goal. However, he stopped this after his brother Bill Gramática tore his ACL while playing for the Arizona Cardinals and celebrating in a similar manner after kicking a field goal. He is a member of Kansas State's Ring of Honor. Gramática was selected in the third round of the 1999 NFL Draft by the Tampa Bay Buccaneers and played there for five seasons. Gramática was the starter for the NFC Pro Bowl team in 2001. In 2002 he won Super Bowl XXXVII with Tampa Bay, scoring 12 points that game and becoming the first Argentine-American in history to do so. Gramática also gained a popularity that allowed him to sign exclusive contracts to make advertisement campaigns for diverse companies. The $14,500,000-contract signed with the Buccaneers in 2002 ranked Gramática among the best-paid Argentine sportsmen after footballers Hernán Crespo, Juan Verón and Gabriel Batistuta. In 2003, Gramática had a noticeable drop in accuracy with field goals of 40 yards or longer, a trend that continued in 2004 until he was ultimately released by the Buccaneers. Gramática was signed by the Indianapolis Colts in December 2004 as a kickoff specialist. 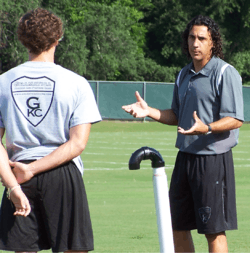 Gramatica later revealed in an interview in September 2005 with The News-Press of Fort Myers that he believed the reason for his struggles was because of torn muscles in his lower adductor and lower abdomen, which he had surgically repaired during the offseason. However, his rehabilitation was not completed until after the season started, and he was out of football for the entire 2005 season. On April 6, 2006, the New England Patriots signed Gramática as a replacement for Adam Vinatieri, who signed with the Indianapolis Colts. Gramática competed with fourth-round draft pick Stephen Gostkowski for the position; on August 23, the Patriots gave the job to Gostkowski and released Gramática. On September 22, he returned to the Colts as Vinatieri's backup and was released on October 4, but re-signed on four days later, and yet again subsequently released. Gramática was then signed by the Dallas Cowboys on November 27, 2006 when they released Mike Vanderjagt. On December 3, in his debut with the Cowboys, Gramática kicked the game-winning field goal from 46 yards out against the New York Giants. Before the start of the 2007 season, Gramática signed a two-year extension with the Cowboys. After being placed on injured reserve for the 2007 season on September 2, 2007, he was released on September 25. On December 12, 2007 Gramática was signed by the New Orleans Saints after kicker Olindo Mare was injured. Shortly after returning to the game, on December 23, he matched his last personal long field goal of 55 yards just before halftime in a pivotal game against the Philadelphia Eagles. In the 2008 preseason, Gramática was challenged by sixth-round draft pick Taylor Mehlhaff for the team's placekicking job. Gramática retained the job as Mehlhaff was waived by the Saints on August 30 during final cuts. Gramática was perfect in field goals with the Saints until September 21, 2008, when he missed two critical field goals in a loss to the Denver Broncos. On October 6, he had a blocked field goal that was returned for a touchdown and a missed 46-yard field goal just before the two-minute warning in a loss to the Minnesota Vikings. Just two days after the game against Minnesota, Gramática was placed on season-ending injured reserve. The team re-signed Mehlhaff as a replacement. The Saints used two other kickers that season. Gramatica was released at the end of the year.